Dc=Double Crochet Pc=Popcorn: 5dc in st, remove hook, grab loops of 1st dc, grab loops of last dc pull through. Round 2: (Ch3, dc, ch1, 2dc) in same st, (beg corner made). Sc in next dc, ch10, slst in top of sc just made, sc in same st, ch12, slst in top of sc just made (right wings made). Fpdc in next dc, sc in next dc, ch12, slst in top of sc just made, sc in same st, ch10, slst in top of sc just made (left wings made). In next st, (2dc, ch1, 2dc) (corner made). Dc in next 3dc, corner in next dc, dc in next dc, fptrc in same stitch as the 1st fpdc, dc in next dc, corner in next dc. Dc in last 3dc and join to first ch3. *Note* Be careful not to snag wings. Work behind them. *Work the corner as you did in Rnd 2 for these next two rounds. I would love to try this some day but right now I am having enough trouble. I am working on a dbl cr ripple afghan for my daughter's boyfriend. It is 4 shades of blue. I'm sorry, I posted to pintrest before asking. I didn't see your note. I shall take it off. HI Kathy, you are more than welcome to put this in pinterest. I have a new copyright, but have not added it to older patterns. Is there a way to make the dragon fly a different color then the rest of the square?? yes there is! I am about to post the revised pattern for the 12" version of this one as well as revising this square to reflect the color changes. I think I should have it posted late tonight or tomorrow morning. 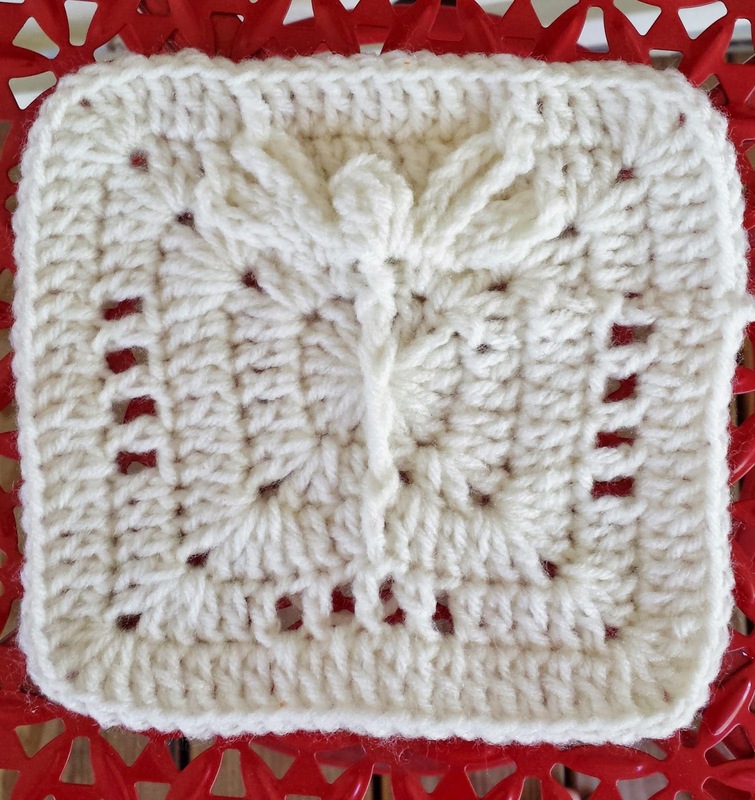 Is it okay to make this 6" square for charity afghans? Hello Evelene, sure I would be honored. I am having trouble making the wings. I don't understand how it is done. Is there a video I can watch. I guess I am not very good at following a pattern. Hi Pam, I will start on a video today and email that to you tonight, if you send me your email. If not I will post the link on my blog as well as commenting here that it's been posted. Video link is now up, you can click the link in the pattern. Thanks! I just saw my email. I will try to look at it tonight. If you can still email it to me at Navywife911@yahoo.com I would appreciate it!! Hi there! I just successfully completed a blue dragonfly square! I love it!! This square along with a couple of other squares not related to your patterns are going to Ohio to join other granny squares made by other crochet ladies....to be made into a memory blanket for the parents of an 11 yr. old little girl that took her own life due to being bullied, I guess at school. Her favorite colors where pink and blue. I made your pattern in a sky blue, and I made another square white and hot pink...a heart pattern circulating around...and will be making two of my own. I want to thank you for providing such detailed instructions...I had no problem, and no mistakes!! It is quite lovely and I must say your very talented in creating such an adorable pattern. I don't know if the little girl liked dragonflies or not, but she loved little birds and I felt she must have loved all nature and this pattern would be fitting for her likes in her short life. These situations are very difficult for parents, I just signed up last evening to be apart of this memory blanket, and they will be going out the door to Ohio tomorrow. The squares were due on the 15th. Once again thank you and you have a lovely evening. Sandy I think what you are doing is truly inspiring. My heart and prayers go out to this family. I hope this afghan is cherished for a lifetime!! Thank you so much for your kinds words. I am so grateful to have fans who love/like my designs. I love your dragonflies and I am planning on using this square pattern to make a pair of mukluks, I think they will be very cute. Some old and some New! !